Was born in 1847. He succeeded to the title in 1870. Educated at Eton, he afterwards entered the Coldstream Guards, retiring with the rank of Captain. He also studied navigation, and secured a master’s certificate in 1874. Of the yachts owned by the Marquis of Ailsa, the three boats Foxhound, Bloodhound, and Sleuthhound, three ‘forties’, were the most famous. 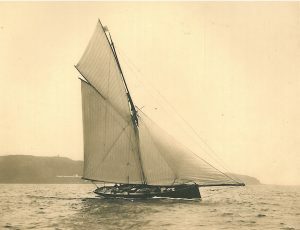 Fox­hound was built by W. Fife at Fairlie in 1870, and in 1871 she won for her owner the Queen’s Cup at the Squadron Regatta. In 1874 Fife built Bloodhound, and in 1881 Sleuthhound. The latter boat carried off Queen’s Cups in 1882 and 1883, and the Albert Cup in 1881. The Marquis has interested himself largely in the encouragement of the Corinthian spirit. He supported the Royal Portsmouth Corinthian Yacht Club, and was one of the owners in the 3-tonner class started in 1882, having had Snarley-yow built to it. He also built the 10-ton Beagle, and designed and built the 5-ton Cocker in his own yard at Culzean Castle. He commanded the Royal Naval Artillery Volunteers, and placed the Titania, 300 tons, at their service. He is a member of the Royal Yacht Squadron, having been elected in 1870, and a member of the Yacht Racing Association. He has designed and built the aux.-motor yacht Red Riding Hood, 13 tons. Clubs: Royal Clyde, Royal Northern, Royal St. George, British Motor-boat. Residence: Culzean Castle, Maybole, N.B.